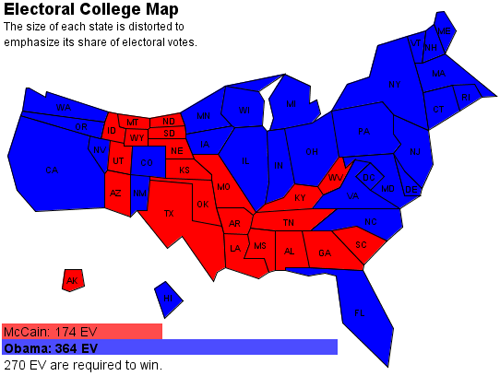 During the last election cycle, I’m sure you saw the distorted United States maps that depicted everything from electoral college distribution (California was the biggest) to distorted news based on geographic location. (DC was the highest). Is our generosity map distorted? Or does it tell us something deeper? As a mental exercise, try picturing a distorted map, not of states, but people. An obvious mapping may be by a person’s size – largest to smallest. If the map is of people from your past, those with the most impact on your life are largest. And if you arrange them by how much time you spend together, the people with which you frequently associate would be most prominent. With that kind of people map in mind, now try mapping the people in your life by generosity. Which people grow and which people shrink on your distorted generosity map? One of the particularly interesting side effects of focusing on generosity for an extended period is that my mental map of the people in my life has changed. Sure, many on my map haven’t changed size since I started this project over two years ago, but some have. Some are radically smaller and there are others who have grown to tremendous sizes. When distributed based on generosity, people take on a new perspective. There are people in my life for which I have a greater respect and admiration thanks in large part to their altruism and selflessness. My hunch is that at any given time we all have arranged people in a mental map, sized according to their importance in our lives. Although that map is only as accurate as our perceptions, passions, and observations, it’s still the map we use as a guide to others. Making a new map, where people are distorted by generosity, may give us deeper insights into the people around us – and our understanding of them. And maybe, a generosity map may not be so distorted after all. Yesterday’s gift of time … Gave a book about marketing to a friend who is trying to grow his business. Day before … Picked up trash in the neighborhood. This entry was posted in In the community, In the Neighborhood and tagged altruism, distorted maps, generosity, Hans Margolius, maps, mental map, selflessness. Bookmark the permalink.